The Mad Catz Analog Steering Wheel for Saturn is a third-party steering wheel for the Sega Saturn developed by Mad Catz. 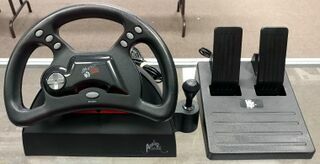 Unlike the official Arcade Racer Joystick by Sega it has pedals and shifter. Basically if a game can be configured to C = Accelerate / Z = Brake the set would work. Gale Racer NTSCJ: detected as gamepad, C can be set to accelerate but Z can't be set to brake. Game has no manual transmission.